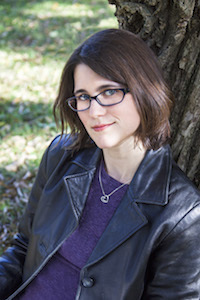 Home » Author Interviews » Tracy Townsend chats about THE NINE, RPGs, and gives away a book! 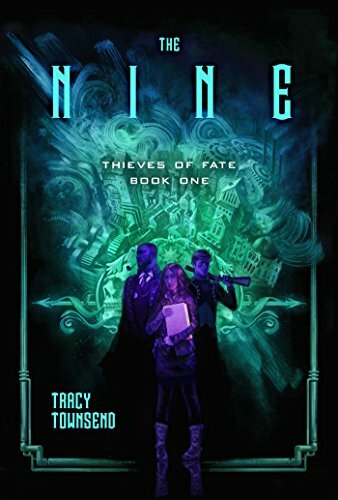 Tracy Townsend chats about THE NINE, RPGs, and gives away a book! Tracy Townsend’s debut novel The Nine is the first book of a series set in a second world. It pays homage to the classics, to steampunk and to role-playing games. Townsend has a Master’s Degree in Writing and Rhetoric from DePaul university and currently teaches writing and science fiction/fantasy literature at the Illinois Mathematics and Science Academy. She’s also taught martial arts and worked as a stage combat and accent coach. We asked Tracy a few questions about The Nine and her writing history. Three random commenters with US or Canadian addresses will get a copy of The Nine. Marion Deeds: First of all, congratulations on your debut novel! The Nine is not only your first novel, it’s the first book of your new series, THIEVES OF FATE. It takes place in a world that seems as if it could have evolved from ours, especially with some of the references to “the old religion.” Amidon, the country (or city?) where the action takes place, seems to be at the peak of an industrial boom, with telegraphs, electric trains, and gunpowder. I loved the descriptions of weapons and clothing, which evoked both a video game esthetic and some of my favorite steam-punk works. What were your inspirations for this setting? Tracy Townsend: The technology of The Nine and its world is a strange, sort of marvelous hodgepodge because its defining attribute is explosive, ambitious change, driven by a broad cultural encouragement to discover and create and no unifying sense of direction behind it. Technologies that, in our world, replaced something prior actually co-exist here — clockworks and steamworks and electricity all bumping up against one another in this untidy “get it done any way you can” exploration. As for the visuals or textures of the world, I suppose every writer is a bit of a magpie, and I’m no exception. Philip Pullman’s His Dark Materials, Max Gladstone’s The Craft Sequence, Scott Lynch’s Gentlemen Bastards Sequence, Alan Moore and Dave Gibbons’ Watchmen, and even flashes of Dickens, Verne, and Dumas were rattling around my head as I wrote. Also, I grew up playing tabletop RPGs, so my head is always full of character portraits and arms and armory arrays. I had years of beautifully illustrated player’s manuals and DM’s guides to refer back to, figuratively and sometimes even literally. Your story mixes the scientific method with religion to create an interesting faith that proposes a Supreme Being but is also based completely on reason. One character even refers to “God the Experimenter,” I think. This belief system is, in some ways, the crux of the book, when a volume is discovered that writes—and corrects—itself, that may actually be God’s lab notes. How did you come up with this intriguing mix of beliefs? And, if you can discuss it without spoilers, tell us how you created the idea of the Nine themselves. The Nine are an adaptation of the Talmudic concept of the lamed wufniks — the thirty-six people God has chosen to justify mankind to Him. If one dies, another person takes their place in the number. The trick of the original mythology is, the thirty-six lamed wufniks are by definition righteous people. It’s only when one dies and a thirty-sixth righteous soul can’t be found to take their place that God will know Man has fallen beyond redemption. Something about that idea smacked of a scientific experiment, with an experimental population and the rest of the world cast into this vast, unknowing control group. I couldn’t help but wonder what kind of world would come about if it were possible to know something like that is actually happening — and how much more considered and even threatening God’s judgment would become if the chosen ones aren’t (by default) righteous, but utterly random. It’s certainly a better experiment if they are chosen at random. Amidon is home not only to humans, but two other intelligent, sapient races, the aigamuxa and the lanyani. The lanyani are ambulatory, intelligent trees, but the aigamuxa seem a bit more complex, physically, than that. I wondered if you were influenced by the Tales of Prester John at all when you created these physically diverse characters. Well, I had to Google Tales of Prester John when I read this question, so I think it’s fair to say I wasn’t influenced by it! But now it’s on my research list. I can’t take credit for the aigamuxa’s creation. They’re part of the khoikhoi mythology of southwestern Africa — an old monster from bush legend, eyes on their feet and all. I read about them in a bestiary of magical creatures I like to browse through, hunting for ideas, and started toying with the concept. In our world, the mythological aigamuxa are monsters that dwell in the desert, and so their ability to pursue humans (one of their favorite foods) is badly hampered by those eyes on the soles of their feet. I wanted that horrific, Pan’s Labyrinth-like visual of an eyeless face curled up with menace, but needed it to actually be attached to a body that could pose a threat. So I transformed the aigamuxa into brachiating jungle-dwellers, and gave them an honest bone to pick with humanity. As for the lanyani, I’ve found the idea of gentle, wispy, arboreal creatures — nymphs and elves and such — tired for a long time, and wanted a creature of the wild uprooted (literally) but “wild” in a very different sense. There’s a grace and beauty to the lanyani, sure, but they’re much more murder-Ents than elves. The aigamuxa are alarming because they’re so very nearly human in so many ways; all our Uncanny Valley sensors flare to life around them. But the lanyani are frightening because they’re so fundamentally alien, even in their efforts to imitate humans and pass among them. It’s been said that human beings are most afraid of the unknown and the unknowable. The lanyani might just be both. While Reverend Philip Chalmers is not, strictly speaking, an anti-hero, he is not a pleasant or terribly heroic character. What was it like to write someone like him? It was fun. Pure, guilty pleasure. Chalmers is a blend of every twitchy, self-absorbed academic I’ve known, regardless of field — a worse-and-unwiser version of all of them, to brutalize an excellent Zelazny quote. I don’t quite understand the intensity of dislike readers feel toward him. (The book is only just peeking its head into the world and he’s already collecting a lot of grief, the poor man.) Roger Ebert once critiqued a film with a comment along the lines of, “Attacking this movie for how bad it is is like kicking a dog for not being better at calculus.” Chalmers is a little bit that way. He’s terrible at people-ing. It’s just not in him. That can change, and needs to — he’s a character who’s just beginning to crest the hill of a growth arc, and one I have big plans for moving forward. Maybe he’ll never be a reader’s favorite, but he’s surely one of mine. This is your first novel. Tell us what the experience of writing it and selling it was like. I’ve told this story in bits and pieces in other places, so I’ll stick to some of the more interesting parts here. First, I wrote the book on a dare – or at least fifty thousand words of it, in November 2012. My first-ever NaNoWriMo project. Second, after I had the first draft partly in hand, I poured another eight months into actually making a whole story of it, met some of the most amazing critique partners and friends I’ve ever had online (I’m looking at you, M&M), and turned my life upside down for another year querying and revising and hoping. There was a great deal of positive feedback along the way — a lot of it still surrounding a “no,” whether from agents or, once I was represented and on submission to publishers, from editors. It’s interesting to see some of their misgivings playing out in the online reviews. It was a polarizing book then, and still seems to be now. “I love the literary voice, but will that work in a book with a heist and a conspiracy and all of that?” “The pacing really takes off in the second half, but the slow build in the first half is a surprise.” “Is this a steampunk book, or clockpunk, or gaslamp, or dystopia, or what?” Some of the same things editors weren’t sure they wanted to take a risk on are, of course, the same things that some readers aren’t so sure about either — but they’re exactly the things that made my agent and editor snap the book up in the first place. For as many revisions as I went through, I’m proud to say I never gave up my style or central vision. That’s something no writer should have to do, and I’m fortunate that it was never even in question for me. What can we expect in the upcoming books? Certainly the ending few paragraphs give us an idea where the story may be moving, but give us a few hints! Well, let’s see. The world gets bigger, with characters leaving Corma and traveling overseas, chasing leads, and getting themselves into trouble. You’ll meet some people The Nine only hints at (Resurrection Jane and Bishop Professor Meteron, for example) and find your way back to some characters the first book seemed to have left behind. And, of course, the aigamuxa aren’t our cover trio’s only concerns anymore. Not by a longshot. You have just addressed one of my issues with the book with your “find our way back to some characters the first book seemed to have left behind.” I guess I’ll see. What authors influenced you? Who was the writer who made you think you could write a book? 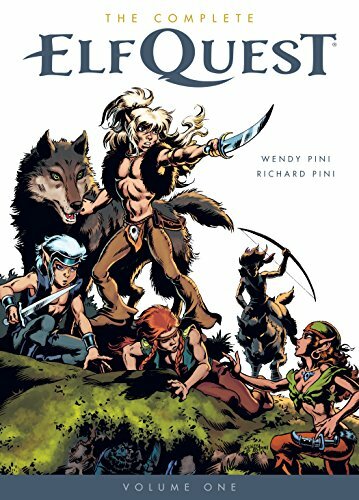 This may seem like a weird one, but I’ve always adored Wendy and Richard Pini’s Elfquest graphic novels. The conflict between the races, the complicated emotional intersections in the narrative, the vast stakes, the “ragtag band of survivors.” It’s a totally different genre reading experience than The Nine but there’s so much I’ve always admired in storytelling right there — so much that made me, as a kid, hungry to create something that would make another reader feel just as swept away. My son is almost old enough to start reading them now, and I can’t wait to geek out about them all over again. 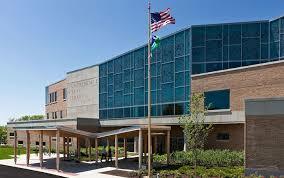 On your blog you write about the importance of libraries in your life. What’s the first library you remember? And did I understand that your local library offers space for people to meet for role-playing games? The first library I remember is the very same local library I write about in that blog post. It’s been torn down and rebuilt since I first stepped foot in it as a small child, but the programming is every bit as rich now as I ever remember it being then. I had a group of friends who met semi-regularly to play RPGs in a “Teen Zone” reading room that flanked the sff collection — sort of the space we’d use to try out new potential gamers and introduce them to our wicked ways. This was long before MeetUp.com or anything like it existed, so we relied on word of mouth and four color fliers hung up around the library vestibule and the local high school’s English department office to draw people in. That library — Fountaindale Library in Bolingbrook, Illinois — still supports a rich array of fandom experiences for its patrons, from elementary age up through adulthood, including tabletop RPG meetings, strategy board gaming groups, Hearthstone and Minecraft clubs, and of course genre-themed book clubs. Sidebar: I also have a weird, deep, addictive relationship with reference books (something I’ll be talking about on John Scalzi’s The Big Idea blog series). That started in libraries, of course, most particularly when I had a work-study job at my university library during undergrad and found myself spending hours re-shelving, running into these marvelous, obscure tomes entirely by accident. So much research defaults to the digital today, with library’s physical holdings at such a premium and so much accessible to the public online. Reference books are a dying construct now, but they’re still a beautiful obsession. At least, I think they’re beautiful. My husband might feel differently about how many of them I’ve packed into our office and bedroom. The blog also mentions that you are forming a “street team” of fans to help get out the word about The Nine. I’d never heard the expression. How does it work? “Street teams” are used in a lot of product promotions, and in the publishing world are most common at the Young Adult level. The idea is pretty simple: you identify people who know your work, or are excited about it, and recruit them to help make your voice and presence louder by taking specific, coordinated actions surrounding your work. The key is to ask people to do things that are easy — retweet things on Twitter, post pictures of the book found in stores on social media, leave reviews on their preferred merchant sites, recommend the book to their book club or library, and so on. My goal is to ask people (in the first few weeks and months, anyway) to do something that will take five minutes or less that becomes much more noticeable when dozens of people in a single week are all doing it. In exchange, these folks get rewards from me: deleted scenes and chapters, behind-the-scenes info about cover art, book two progress, and even some material freebies and swag. If any of your readers are interested in joining up, they should go to www.tracytownsend.net and sign up for my newsletter at the top of the page. I’m sending another street team mission request and reward out this week! strong>What is your favorite role-playing game? Amber Diceless Role-Playing, by Phage Press! I grew up reading and loving Roger Zelazny, but sort of fell into his work backwards. 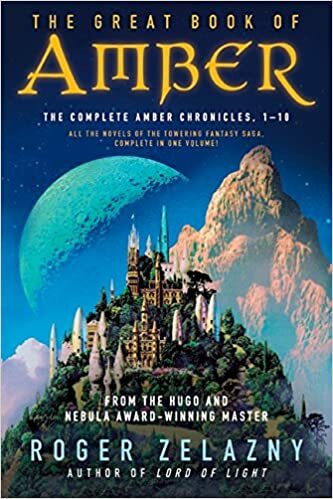 Those same friends from the library gaming groups turned me on to this game, and the next thing I knew, I had homework: read the Chronicles of Amber so I’d know all the backstory. Amber DRPG takes a very confident storyteller and a very thoughtful, clever group of players. Without dice to decide your fate — just your peer players and the storyteller — you have to put aside all your persecution complexes and conspiracy theories and embrace trust in sharing the story. Honestly, that’s the best part of the gameplay. Explaining your actions, setting a scene, understanding the give-and-take in the building narrative, and seeing your machinations succeed or fail not because of pure probability, but because of a collective drive to shape the story toward a powerful outcome for the whole group. No game on earth has taught me more about working through characters’ problems authentically and sizing up the problems in a plot path. I believe you teach creative writing now. What is the biggest challenge of teaching young people how to write? The hardest part of teaching writing — creative writing or academic writing, really — is teaching students to embrace risk. It makes sense for students to be wary of it. They have grades, and the teacher’s judgment, and the esteem of their peers to worry over, so they aim for safe things, because it feels good to be told, over and over again, “You did that right!” But there’s so rarely a clear “right” in writing, which makes the whole enterprise daunting. Getting students to understand how counterproductive it is to fear judgment, and how they stymie themselves by avoiding big ideas or tough projects, is a constant struggle. So I show them my awkward drafts and rejection letters. I make sure they’re constantly being reminded that I’m not perfect, either. We laugh together, because it’s better than tearing our hair out when things get tough. You know learning is happening when the students are laughing. You’ve grabbed them right where they live. Here at FanLit we always ask our writers to share their favorite beverage with our readers. Selections have ranged from whisky to fancy cocktails to hot chocolate. What is yours? Ah, this one’s easy. Barry’s Irish tea, gold blend, brewed longer than makes any damned sense, with two lumps of sugar and a splash of milk. If it were possible to live well drinking nothing else, I would. Tracy, Thanks for spending time with us! And I’m looking forward to the second book in the adventure. Readers, three random commenters with US or Canadian addresses will get a copy of The Nine. So cool she mentions elfquest. The mythology seems fresh, would like to check this series out. ☑ Mention of old world myths: Talmud and Lamed Vavniks. (And bonus “☑” for mentioning the importance of libraries. “The Nine” is now officially on my list. Yagiz, the Lamed Vavniks were new to me. Really interesting… and she got a great cover. THE NINE sounds amazing and that cover, wow! I like the magpie thinking! And I see other people were, like me, unfamiliar with the lamed wufniks. Looks like a fine adventure! I kept thinking “lamed” was a typo, but it’s not. As far as I remember it’s not English ? Thanks for the interview, Marion, and thanks for your interest! anyone who calls themselves addicted to reference books gets an automatic “I’ll have to check them out” (no library pun intended well maybe a little) from me . . . I thought of you, Kat. Tracy, thanks for the link! Great interview! Wow, deffently adding to to my to be read list! Love tea and libraries! Wow this book sounds awesome. Definitely going on my to-read list. Also, got a great new RPG rec, a new tea to investigate, some wonderful book recs, and a reminder of how much I love the library. This is a fantastic interview! Thank you so much! Yes, I am delighted by that RPG. Tracy gave us all kinds of cool info. Ok, I hadn’t been interested but the interview sold me on it. Really enjoyed the write-up. Checked out the book on Goodreads and I’m always drawn in by a good synopsis. Thanks! Gary Strothers, Yagiz and Chell, if you live in the USA or Canada, you win a copy of THE NINE! Please contact me (Marion) with your US address and I’ll have the book sent right away. Happy reading! I’m truly looking forward to reading THE NINE. Thanks again, Marion & Tracy.